The combined shirt sponsorship income of the Premier League’s 20 clubs has again defied the recession by rising £18.65m year-on-year to a record £165.75m this season – with big winners but some fallers among the new deals. An increase in the total sponsorship revenues reconfirms the strength of the Premier League as a platform to shift product and has enabled a number of clubs to benefit despite the uncertain economic conditions. The biggest single leap in shirt deal income this season is at Arsenal, who previously – famously – were making only £5.5m a year from their shirt deal with Emirates. The renegotiated package now in force is worth £30m a year, a jump of £24.5m. There have also been leaps at Tottenham (with two shirt deals worth £19m), Chelsea, Stoke, West Ham, Swansea and Fulham. The values for last season, this season and the differences, on a club by club basis, are in the graphic below. The figures for both years have been put to every club individually and club sources have approved them. There were a few clubs who approved last year’s figures when Sportingintelligence conducted this exercise last year, and now say last year’s figures were slightly out but this year’s figures are correct. For sake of consistency, this graphic shows last year’s figures as approved last year, and this year’s figures as approved this year. 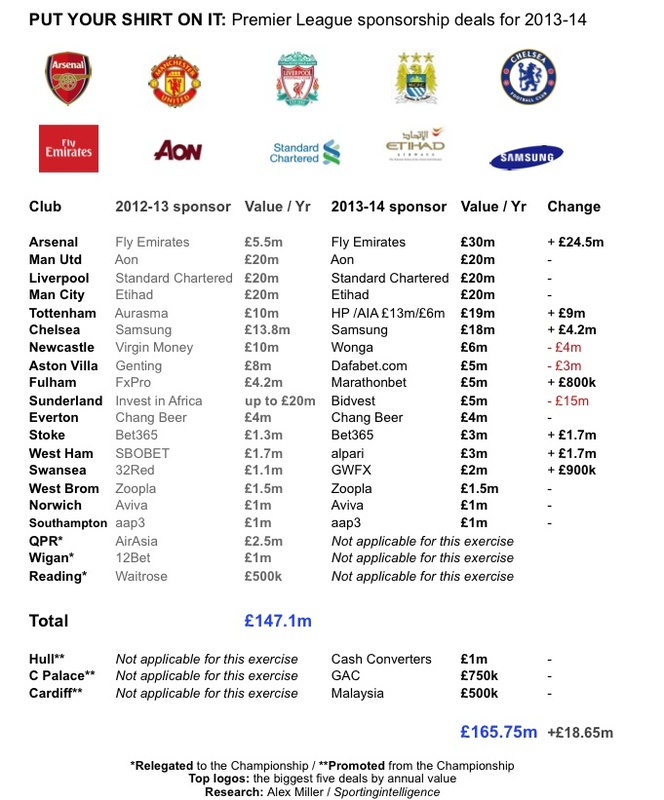 2010-11 sponsorships here. 2011-12 sponsorships here. 2012-13 sponsorships here. Newcastle’s controversial £24m four-year shirt sponsorship deal with payday loans company Wonga created headlines over summer when star striker Papiss Cisse refused to wear the new strip during pre-season on religious and ethical grounds. The value of the deal represents a £4m a year fall on last season’s arrangement with Richard Branson’s Virgin Money. Aston Villa have taken a £3m a year hit after replacing Genting with Dafabet.com in a deal understood to be worth £5m a year. Our headline total of £166m would have been higher if deals such as Manchester United’s £19m a year training kit deal with AON (on top of main kit deal) was included. AON’s training kit deal replaces the previous £10m-a-year training kit deal with DHL. Several other Premier League clubs are understood to be actively pursuing similar deals. Another big uplift in the Premier League’s total is virtually guaranteed next season to the overall total as Man Utd’s bonanza shirt deal with Chevrolet gets underway, worth a staggering £52m a year, or an increase of £30m a year on the AON main kit deal now. The global reach of the Premier League was reconfirmed with an increasing number of foreign-based companies continuing to adorn club shirts. This season 10 shirts feature overseas-based companies, compared to seven last season. Companies from the United Arab Emirates, South Korea, the US, the Philippines, South Africa, Thailand and China are represented. Gambling companies continue to feature prominently in the Premier League. This season three shirts feature gambling companies, Aston Villa (Dafabet.com), Fulham (Marathonbet) and Stoke (Bet265) – a fall from five last season. On the other hand, the number of controversial payday loan firms has jumped from zero to two, with Wonga at Newcastle and Cash Converters (who are also pawnbrokers) at Hull.